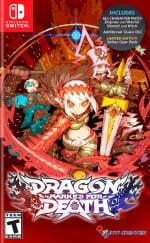 Back in July, Inti Creates released a new trailer for Dragon: Marked for Death to coincide with the announcement the anticipated title was arriving on the Switch eShop this winter. The latest Nindies Summer Showcase presentation has now confirmed the game will be released on 13th December. As previously explained, the side-scrolling action-RPG allows players to team up with three others as they take on 30 quests. There are a total of four classes including the Empress, Warrior, Shinobi and Witch, with a story fueled by revenge. The title was originally revealed in August last year during the previous Nindies Summer Showcase. Exactly a year on, it's now got a release date. Inti Creates previous Switch eShop releases include the likes of Blaster Master Zero and more recently, Bloodstained: Curse of the Moon. Take a look at the trailer above and tell us in the comments if you'll be downloading Dragon: Marked for Death on release. Looks good. Although trying not to get overexcited. I loved the Megaman Zero games but he Gunvolt games somehow didn’t feel right. This does look like more direct combat and more zoomed out viewpoint like MMZ. This is one of the games I hoped we'd get a release date for, so it's great news. Is this getting a physical release like their Gunvolt games? I love what Inti Creates has been doing on Switch. This game is definitely on my radar! Glad it finally has a date. I was really hoping for that. With this and Into the Breach (amazing game btw!) out of the way, I'm rooting for the inevitable Invisible Inc. announcement in the next Direct! I'll be playing this alongside Smash for sure. I'd follow Inti-Creates to hell I love 'em so much... their games are fun as hell and I'm looking forward to this. I really dig Inti Creates as a dev. I have faith that this'll be good! top notch pixelart and character design! Glad to finally be getting a release date for this game. Cool! Reminds me of that one anime with a similar concept of people having body parts of a deity/dragon. This might be the first Inti Creates game I skip. I don't care about multiplayer grind-a-thons anymore. @Kinoen You mean "Yona of the Dawn"? Yeah, that was my impression, too.